Just4Keepers Goalkeepers are entitled to train 6 days a week at ALL Just4Keepers Goalkeeper Coaching Venues, for as little as €2 per session ! Just4Keepers are all about goalkeepers progressing & improving their ability as a Goalkeeper so at Just4Keepers Goalkeeper Camps we encourage our keepers to train as often as possible, for your one off monthly fee you can train EVERY DAY of the week at ALL J4K Goalkeeper Training Venues at NO extra cost. So the more you train the cheaper it is ! Crumlin Keeper Morgan Rice attends four J4K sessions a week in Wayside Celtic, Peamount FC, Clondalkin & Lourdes Celtic, with a cost of LESS THAN €2 per session. Now that is value ! 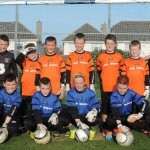 Not only do J4K have the best goalkeeper Coaches in Ireland we also offer the best Value for our goalkeepers.